The Classic: Effortless styles that look great on everyone. This long sleeves top is a synonym of comfort. Featuring a henley neckline and sleeves with tab, it is perfect for any casual outfit. Love love love this stylish top! Great for a casual look, but can be dressed up with dressier pants/skirts. I bought it a size too large, my fault, but it washes like a rag. Not a wrinkle in it when I took it out of the dryer. Nice for travelling. Great for a casual addition to Jean's. 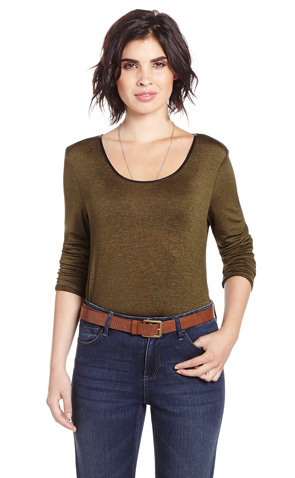 Love this for the cool mornings/warm afternoons (transitional weather) - it can be long sleeve or 3/4 length sleeve. Good colour, great fit - what more could a gal ask for! I can comfortably wear it with leggings.